For the first time that I can remember, Michonne smiled. She probably has smiled before in the series – but not like this. As Daryl is being grilled by one of the red-shirts (Brad?) about his past life, surrounded by the corpses of hundreds of dead, hunting for supplies, Michonne allows herself a laugh and a smile, which sets the tone for “30 Days Without Accident”. Yes it’s the end of the world, but not everything is all that bad. Until it is. Lets get to the biggest plot point, which is the inclusion of the “big bad” that the producers had been teasing. A deadly disease has come to the prison, and as one would expect, probably will be around for a while. Patrick, one of the many red-shirts the Woodbury citizens will provide, falls ill, gets a fever, and promptly dies within the course of a single day. It is a bit far fetched that this would (a) not be noticed, and (b) be able to kill him as quickly as it has, so it does ask for a certain sense of disbelief. What is interesting about this whole ordeal is how the episode provides multiple “Patient Zero” for audiences to question: was it the sick pigs? The fact the children hung out with Nick the zombie all day? Or was it because of the wonderfully meta moment where Patrick has a fanboy geek-out over Daryl? Providing multiple explanations only helps to deepen mistrust within the prison ranks, and could potentially lead to a great The Thing--like standoff. The episode otherwise splits neatly into two separate story threads. Daryl and the gang’s expedition to the supermarket was definitely the highlight of the episode, as we were treated to a particularly awesome sequence with zombies crashing from the ceiling, providing a definite horror movie moment. It also gave us another of the more memorable zombies in a long time, as one of the poor things was hung from the ceiling by its guts. As mentioned before, the scene where the gang were guessing Daryl’s previous occupation was a nice touch, and will do well for building up to the moments where things aren’t going quite to plan. The other story, Rick’s encounter with the crazy lady, felt a bit too familiar. While it’s always nice to catch up with the world outside the prison, it felt too reminiscent of his excellent re-encounter with Morgan last season. Coming across a character who reminds Rick of what he could become is a bit stale right now, especially considering this is a woman who we have zero investment in, and really only serves to highlight the three questions that Rick asks new survivors. “30 Days Without Accident” sets up the season well. 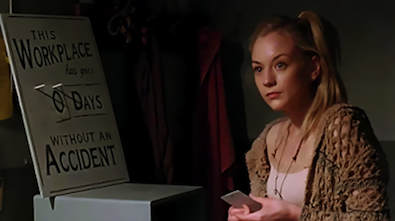 While times have been okay for a month now, it wouldn’t be The Walking Dead if everything didn’t go wrong all at once. Now all we need is a hint at what the Governor is up to. Then everyone would be in trouble. Carol has enjoyed an excellent arc throughout the series, and the tough mum act really suits her well. I hope they expand on this in further episodes. Speaking on Carol – are her and Daryl a thing now? I really hope not, as I have always read their relationship more as a familial one. This episode also has the introduction of Bob Stookey, who people will remember from the comics. His battle with the alcohol was a nice touch, considering it was the choice not to fall back into that hole which almost got him killed. Fans of the comics will know to keep an eye on Stookey. Fans of the show should do so too. Carl is definitely much better than where he was in season two. It’s interesting to see how these events are really messing with his childhood. The council eh? I wonder of Rick’s a part of it, or whether he wants to sit out considering the Ricktatorship.